“That’s why, as part of the Climate Action Plan I announced this year, my administration is partnering with you to identify where your lands are vulnerable to climate change, how we can make them more resilient,” the President said. 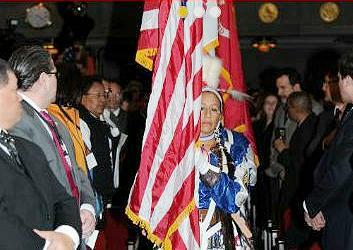 Secretary of the Interior Sally Jewell kicked off the 2013 White House Tribal Nations Conference, welcoming leaders invited from all 566 federally recognized tribes at the fifth such conference hosted during the Obama Administration. Thirteen members of the Obama Cabinet were in attendance. Jewell noted progress in the federal government’s efforts to expand and institutionalize consultation with tribal nations on energy development and mitigating the impacts of climate change. Jewell announced that the administration has set a goal of placing more than 500,000 acres of land into trust by the end of President Obama’s term. The Bureau of Indian Affairs has processed more than 1,400 individual land into trust applications since 2009, accepting more than 230,000 acres in trust on behalf of tribes. Placing land into trust secures homelands for tribes, said Jewell. SACRAMENTO, California, November 13, 2013 (ENS) – Twenty leading climate experts today called on Governor Jerry Brown to impose an immediate moratorium on fracking in California. In a letter delivered this morning, the experts say fracking and other extreme oil and gas extraction techniques disrupt the climate and harm California’s efforts to be a leader in reducing greenhouse gas emissions. Fracking uses pressurized water mixed with sand and chemicals to blast open rock formations, releasing oil and gas. Drilling and fracking have been tied to air pollution and water contamination across America. Studies link underground disposal of fracking wastewater with increased earthquake risk. A June 2013 poll conducted by the University of Southern California and the Los Angeles Times found that 58 percent of Californians want a fracking moratorium in the state. Experts who signed the letter include: retired NASA climate scientist James Hansen of Columbia University, Michael Mann of Penn State University, Michael MacCracken of the Climate Institute, Ken Caldeira of the Carnegie Institution for Science and Anthony Ingraffea of Cornell University. The letter, which was organized by the nonprofit Center for Biological Diversity, notes that much of the oil currently extracted in California is as carbon intensive as the Canadian tar sands, one of the most climate-disrupting fuels on Earth. “The destructive climate impacts of fracking California for billions of barrels of dirty oil should be more than enough reason for Gov. Brown to halt fracking,” said Shaye Wolf, climate science director of the Center for Biological Diversity, who signed the letter. At least 1,200 California oil and gas wells have been fracked in the past three years without scientific review, and oil companies now are targeting the Monterey Shale. In contrast to California’s policy of green-lighting fracking, the federal Bureau of Land Management has not held any oil and gas lease sales on California public lands since launching an independent scientific study of fracking statewide. WASHINGTON, DC, November 13, 2013 (ENS) – So many millions of acres of trees in Colorado have been killed by bark beetles that the U.S. Forest Service has awarded a research grant to a Colorado State University team to explore turning all that wood into biofuel. A $10 million research grant from the U.S. Department of Agriculture was awarded by the Forest Service this week to a CSU-led consortium of academic, industry and government scientists to develop small, mobile biorefineries that can be moved across the blighted forests. Their “distributed scalable biorefinery approach” is key to the use of insect-damaged trees as biofuel feedstock. “Infestations of pine and spruce bark beetles have impacted over 42 million acres of U.S. forests since 1996, and a changing climate threatens to expand the threat from bark beetle on our forest lands,” said Agriculture Secretary Tom Vilsack, announcing the award. “As we take steps to fight the bark beetle, this innovative research will help take the biomass that results from bark beetle infestation and create clean, renewable energy that holds potential for job creation and promises a cleaner future for America,” said Vilsack. Under the grant, Colorado-based members of the Bioenergy Alliance Network of the Rockies (BANR) – including Colorado State University, the Colorado Forest Service at CSU and the National Renewable Energy Laboratory – will collaborate with partners at the University of Idaho, University of Montana, Montana State University and the University of Wyoming and the Forest Service Rocky Mountain Research Station. They will all work together with industry partner Cool Planet Energy Systems to demonstrate the new technology. The technology is pyrolysis, a well-known thermochemical decomposition of organic material at high temperatures in the absence of oxygen. The new part is Cool Planet’s prototype pyrolysis system that can be tailored to the amount of feedstock available, and can be deployed near stands of beetle-killed timber, lowering the costs of wood harvest and transportation. “Our technology is being commercially deployed today to convert southern pine into biofuels and biochar,” said Cool Planet CEO, Howard Janzen. “The BANR grant will allow us to apply what we learn to the efficient and affordable conversion of beetle-kill pine into the same high octane, drop-in fuels and soil enhancing biochar products,” he said. “Utilization of the beetle-kill wood and other waste biomass from forest thinning and fire hazard reduction has great potential for biofuel production,” said Keith Paustian, professor at CSU and BANR project director. There are many benefits to using beetle-killed wood for renewable fuel production. It requires no cultivation, circumvents food-versus-fuel concerns and likely has a highly favorable carbon balance. It clears the dead standing forests. Firewood permits are issued to the public, but little of the wood of these vast, dead forests is used in that way. Rocky Mountain National Park staff continually research more options for using material from hazardous tree removals. Yet the wood is located far from urban industrial centers, often in inaccessible areas with challenging topography, which increases harvest and transportation costs. Environmental impacts, social issues and local policy constraints to using beetle-killed wood and other forest residues remain unexplored. The BANR project will do a comprehensive economic, environmental and social policy assessment and integrate the findings into a web-based, user-friendly decision support system. “This project has enormous potential benefits for Colorado and all western states where forests have been devastated by the ravages of beetle-kill,” said Colorado State President Tony Frank. “We’re grateful to the USDA for recognizing the important economic and environmental questions at stake here and the unique combination of strengths we’ve been able to draw together in this research consortium. COLLEGE STATION, Texas, November 13, 2013 (ENS) – Rains have recharged many Texas reservoirs over the last few months, yet some remain at critical levels, according to a water specialist with the Texas Water Resources Institute and reports from Texas A&M AgriLife Extension Service personnel. While Central, East and Coastal Bend regions have seen improvements to reservoir levels, other parts of the state are still coping with water issues, said Allen Berthold, program specialist with the institute. In some cases, the available water supply is measured in months, and severe usage restrictions are in place. “When I talked to county commissioners in the Wichita Falls area last week, I was told some cities had approximately 180 days of water left at current usage levels,” Berthold said. The commissioner’s court planned to supplement reservoir levels with wells, but the overall effect on long-term supplies will be minimal, Berthold said. The Texas Water Development Board says monitored reservoir levels were about 62 percent full as of today. But the average is skewed by reservoirs generally being in fair to good shape east of U.S. Interstate 35. Many reservoirs in West Texas remain critically low and the Twin Buttes Reservoir is empty. Dallas and Fort Worth have seen some relief in recent months, Berthold said. Long range planning by the North Texas Municipal Water District water conservation and new supply systems may offset losses from the drought and the quarantine of Lake Texoma for a zebra mussel infestation. For cities and rural towns without a plan and funding in place, some help may be in sight, Berthold said, as Texas voters approved Proposition 6, which allowed the transfer of money from a rainy day fund. The plan proposes to reduce borrowing costs for municipalities to build and enhance water projects during the next 50 years. COLUMBUS, Ohio, November 13, 2013 (ENS) – The fight to curb Lake Erie’s toxic algal blooms is getting attention and funding. The Ohio Phosphorus Task Force II today issued its final report on findings to support reduction of phosphorus loading and associated harmful algal blooms in Lake Erie and surrounding watersheds. Recommendations include the development of loading targets for the Maumee River watershed and other Lake Erie tributaries, expansion of current phosphorus monitoring programs, and working with area stakeholders to improve soil health, nutrient retention, and proper timing and placement of applied fertilizers. Recommendations could improve water quality throughout the Lake Erie watershed, lead to cost savings for farmers due to reduced need for fertilizer, improve public health as combined sewer systems are updated to reduce overflows, and further reduce phosphorus content in commercial lawn care products. Phosphorus, which is contained in animal manure and commercial fertilizers, is the nutrient that determines how much harmful algae can grow in Lake Erie. Harmful algal blooms in Lake Erie most often consist of Microcystis, a cyanobacterium commonly called blue-green algae. The blooms produce toxins harmful to the ecosystem, animals and people. The toxins can be removed from drinking water drawn from the lake, but increase the cost of water treatment. Harmful algal blooms reduce tourism income, as recreational waters are made hazardous and unpleasant with floating layers of blue-green algae. Task force members at the press event, held at the Ohio Department of Natural Resources, included the heads of the state EPA, Department of Natural Resources and Department of Agriculture, along with farmer Terry McClure and Gail Hesse, executive director of the Lake Erie Commission. Also today, the U.S. EPA today announced a $500,000 Great Lakes Restoration Initiative grant to the Ohio Lake Erie Commission to study the causes of harmful algal blooms and low oxygen levels in Lake Erie. The project will track the movement of various forms of phosphorus and nitrogen in the Western Lake Erie Basin; assess nutrient sources that contribute to formation of harmful algal blooms in the basin, and examine the extent to which phosphorus loading in the basin contributes to low oxygen levels. SHREVEPORT, Louisiana, November 13, 2013 (ENS) – The City of Shreveport has agreed to upgrade its sewer system to reduce overflows and pay a $650,000 civil penalty to resolve Clean Water Act violations stemming from illegal discharges of raw sewage since 2005, the U.S. Justice Department and the U.S. Environmental Protection Agency said today. The state of Louisiana, a co-plaintiff in this case, will receive half of the civil penalty. Authorities say the cause of the illegal overflows stems from the city’s failure to properly operate and maintain the condition of the sewer system, resulting in discharges of untreated sewage into local waterways and the community. Shreveport’s wastewater collection and treatment system serves 220,000 people in an environmental justice area. To comply with the Clean Water Act, the city estimates it will spend $342 million over the next 12 years in order to improve the sewer system’s condition. While the city upgrades the system, it will also implement a program for capacity management, operation, and maintenance to help reduce sanitary sewer overflows.